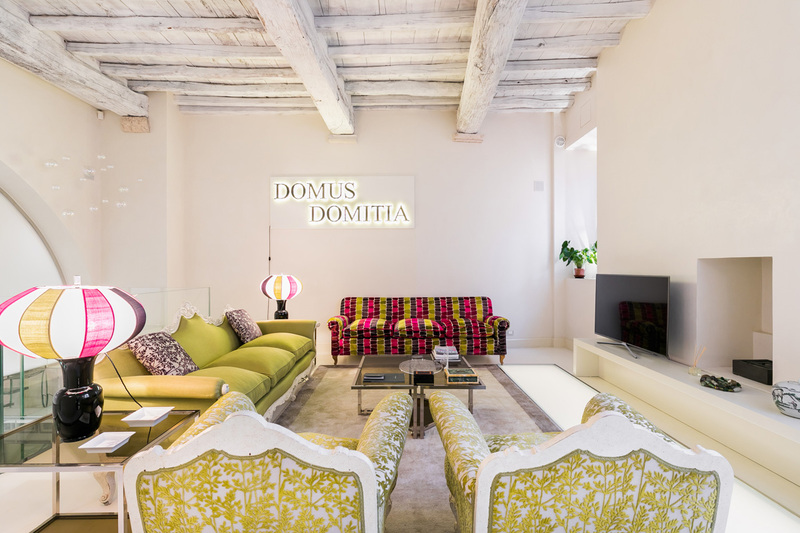 In a quaint paved street just off the famous Via dei Coronari, a spectacular arched doorway designed by architecture Sangallo greets guests into the 17th century palazzo. 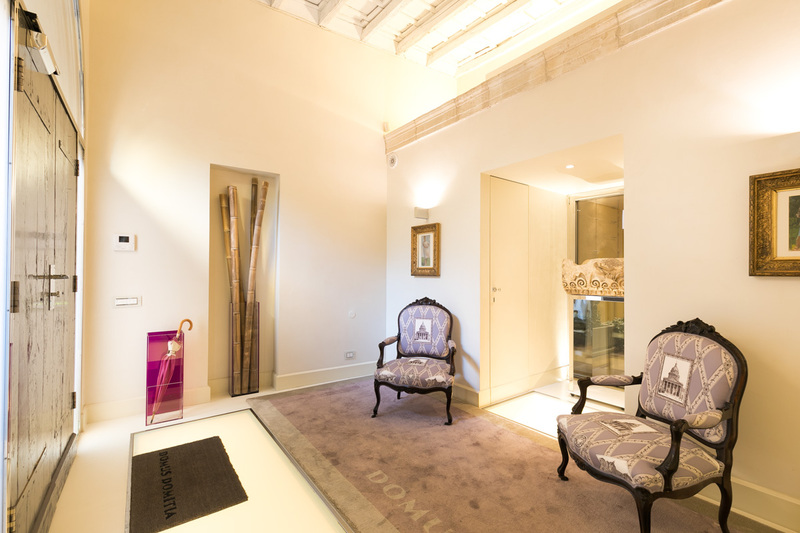 The residence’s interiors display an eclectic combination of modern design, contemporary art and traditional furniture. 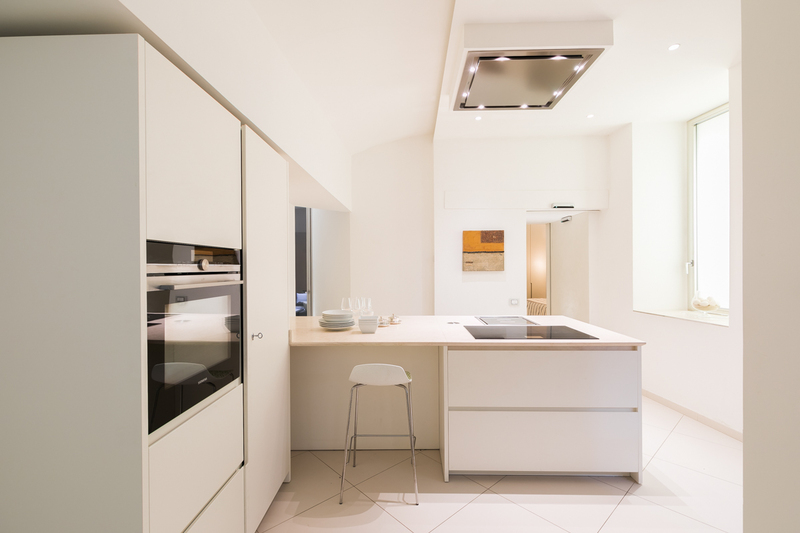 Pearl white walls and floors are contrasted with splashes of bright colour. 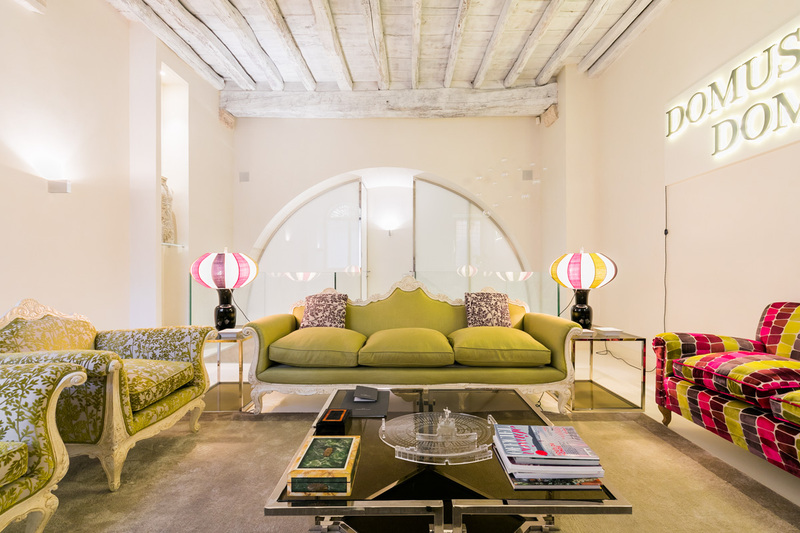 Upon entering the living room, guests will find vibrant-coloured sofas from the early twenties to relax in style. 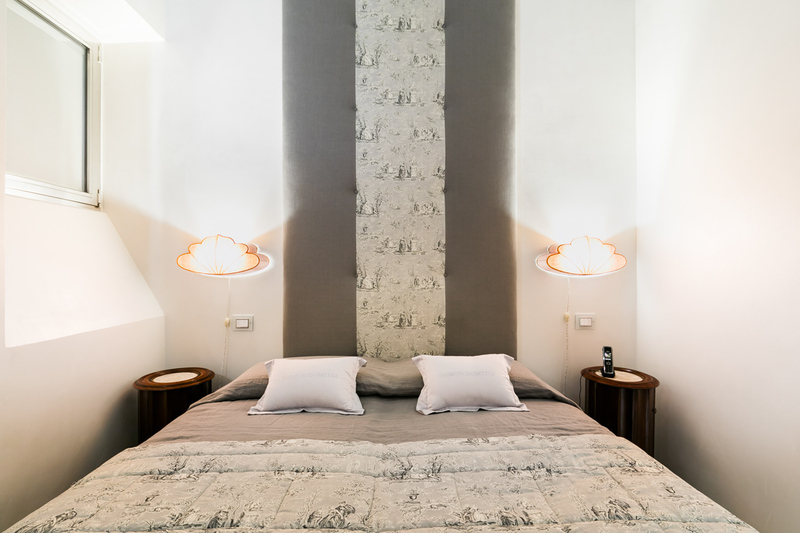 The Rome Luxury Residence’s master suite is characterised by a lit panel and futuristic fabric lamps designed by artist Paola Napoleone. 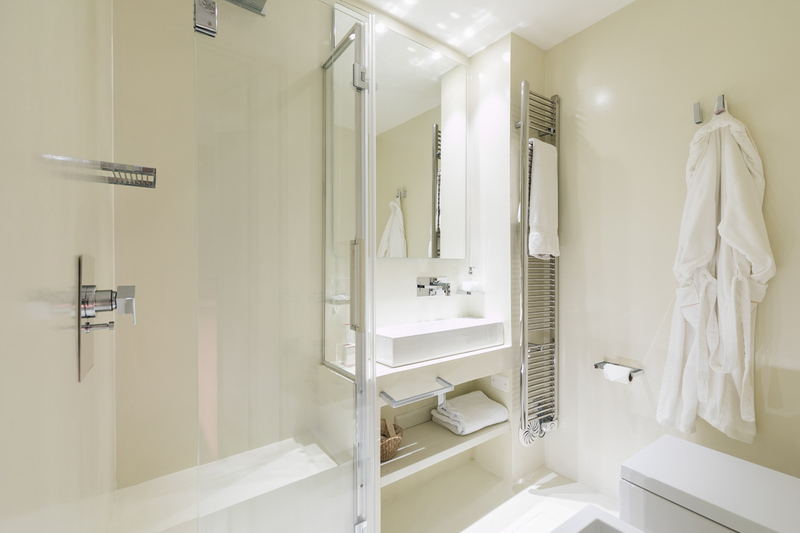 It is furnished with a king size bed and features a modern en suite bathroom. 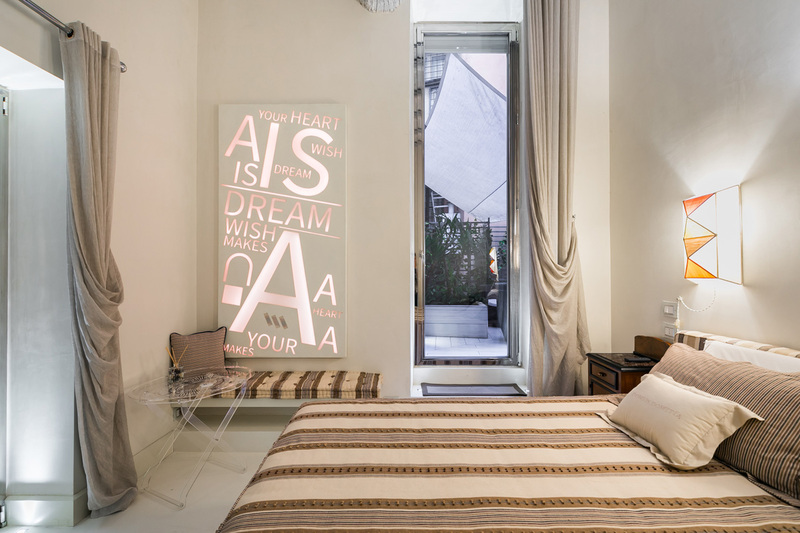 This bedroom accesses a charming private courtyard with a lounge area and vegetation. The beautiful climbing ferns and potted plants which contrast with the terracotta-colour walls provide a familiar and relaxing atmosphere. 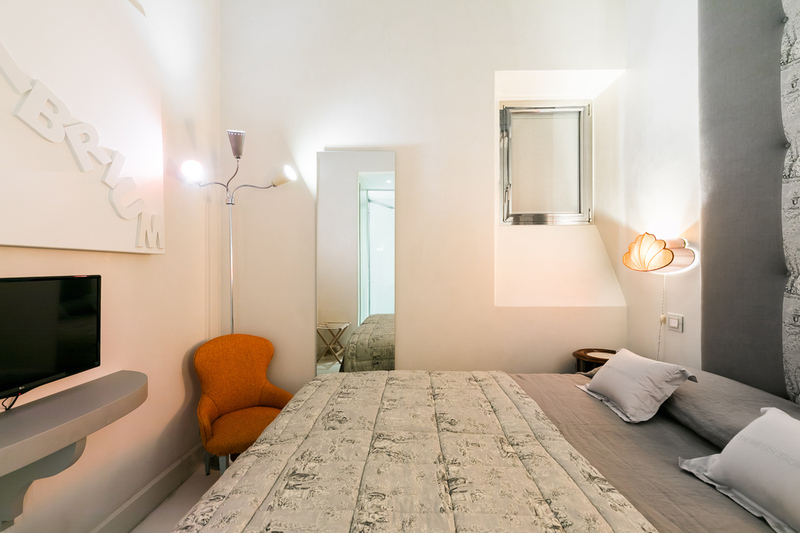 The second double bedroom is decorated with beautiful Toile de Jouy fabrics and furnished with a comfortable king size bed. 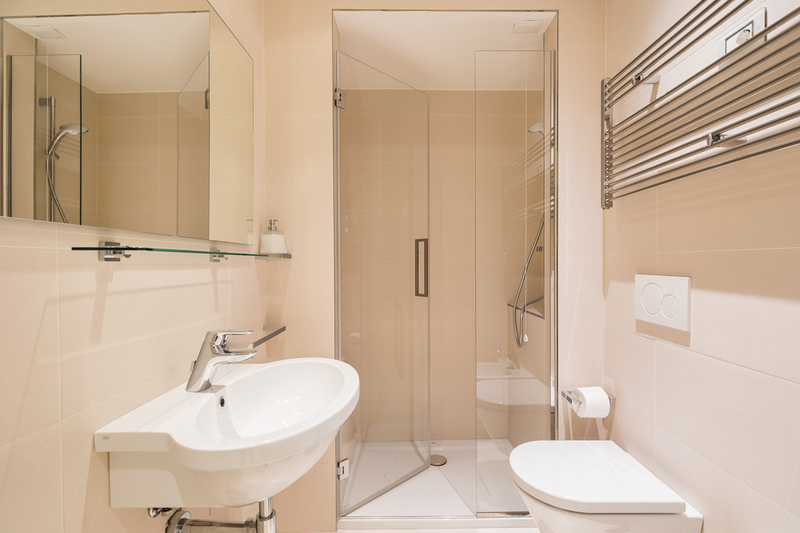 It also features an en suite bathroom. 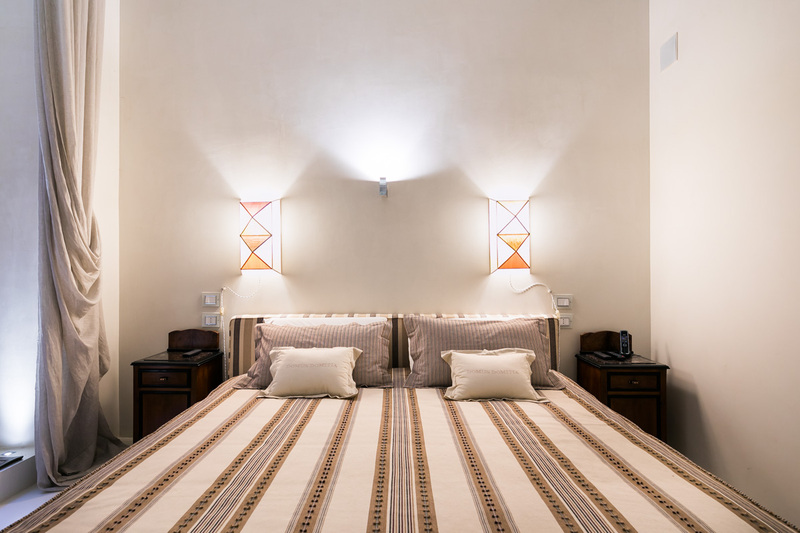 Two other comfortable bedrooms can be found in the Rome Luxury Residence: one furnished with a double bed, the other with large twin beds. 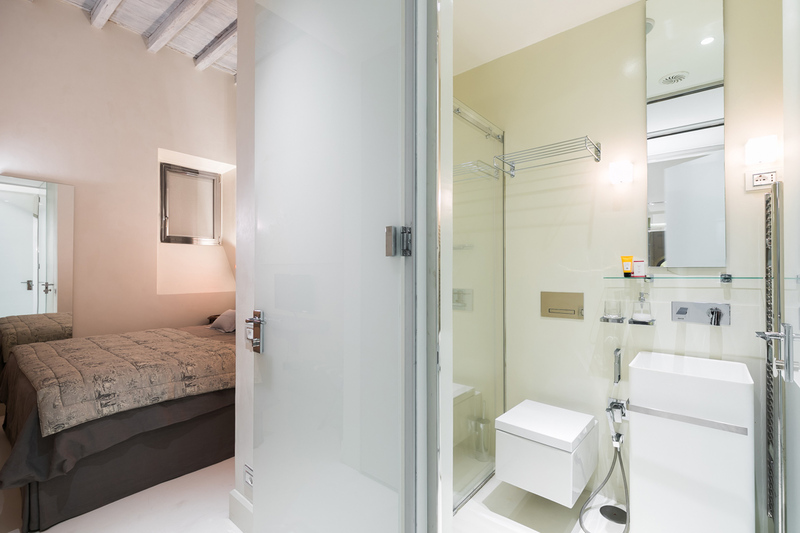 A shared modern bathroom neighbours these rooms. 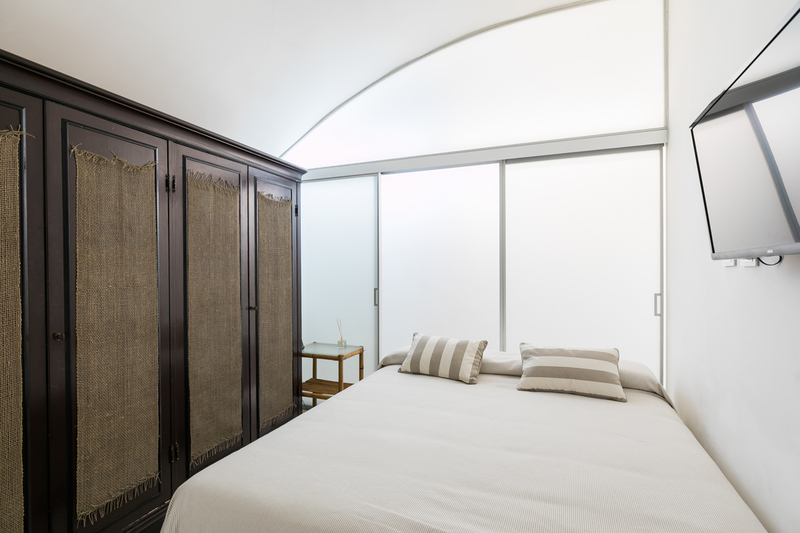 The numerous bedroom options available to guests provide them with total freedom, with an infinity of possibilities in terms of sleeping arrangements. Indeed, the total capacity of the residence is 10 guests, meaning that the maximum number of 7 guests are guaranteed plenty of room. 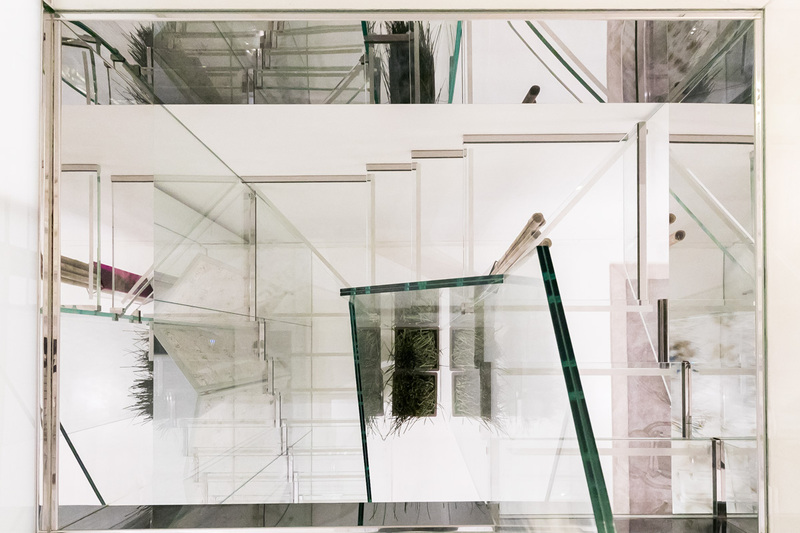 Going down the splendid glass staircase, guests will find the grand dining area. 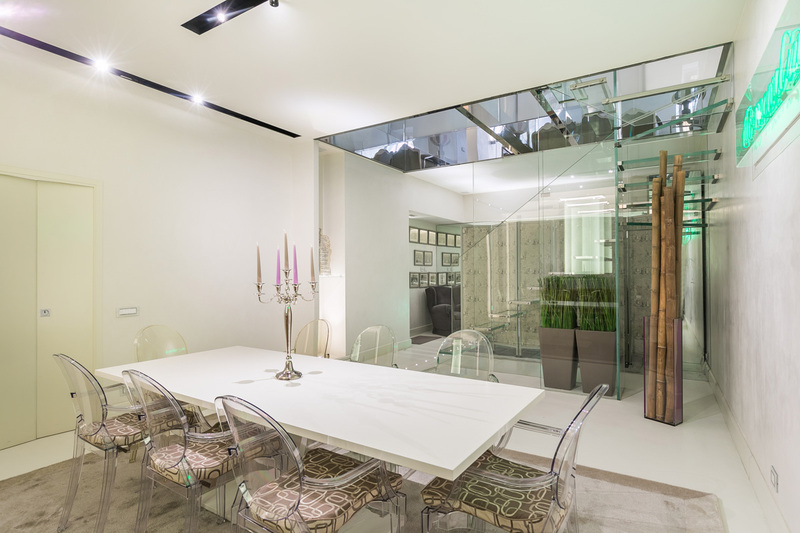 With its unique design, the dining table seats up to 8 guests on Louis Ghost chairs designed by Philippe Starck. This area is also particularly notable for its italic latin phrase which lights up on the wall, stylishly recalling the 1950s bar scene. The other side of the staircase holds the wellness area with the residence’s own spa. 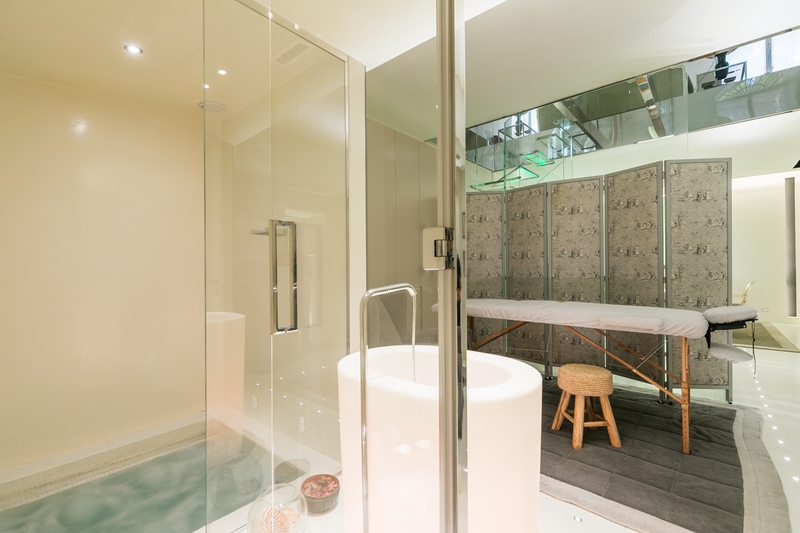 Allow yourself to sit back and relax in the jacuzzi or Hammam. A massage area is also at guests’ disposal, surrounded with comfortable armchairs. This floor also features a small study, furnished with a desk can sleep two guests on a fold out sofa. This is ideal for people who wish to have independent access outside without having to go through the main entrance. Indeed, the villa features a staff access which leads straight to this room. 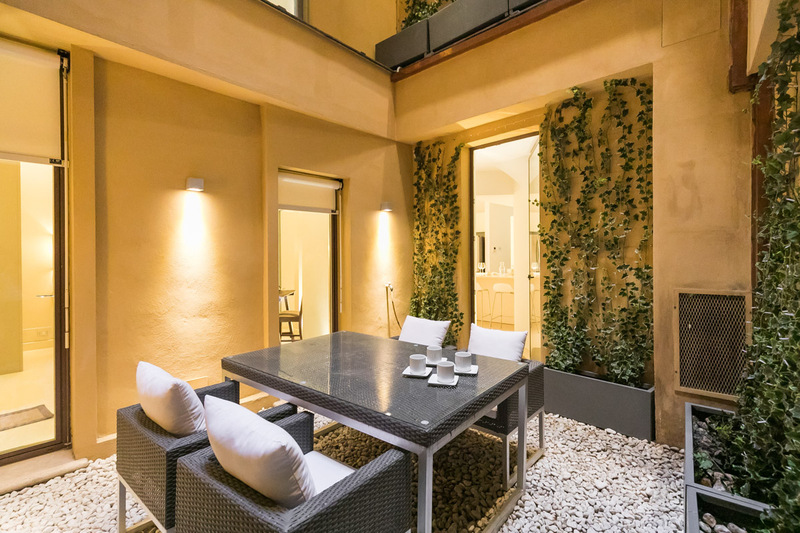 It also leads to a second charming courtyard featuring a table and chairs for a drink or a meal in the fresh air, with plenty of privacy. 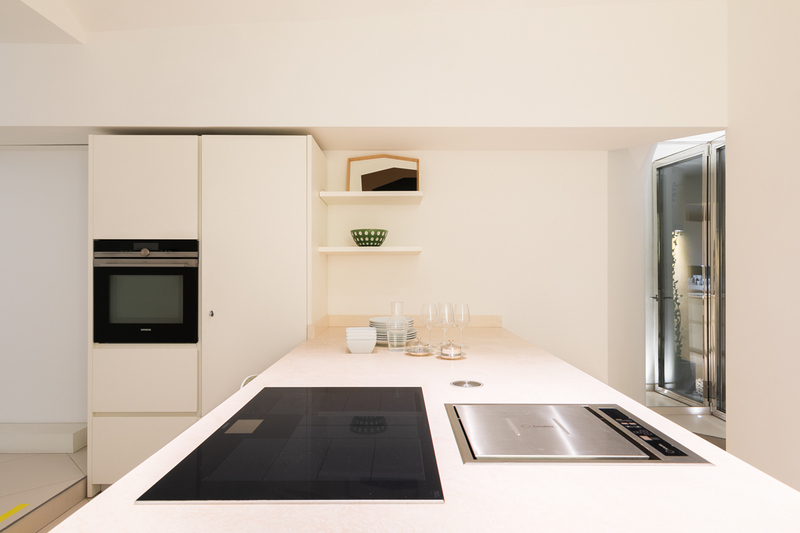 Through double glass doors, guests will access the spacious modern kitchen. It is fully equipped with anything you may need and provides plenty of storage and workspace. 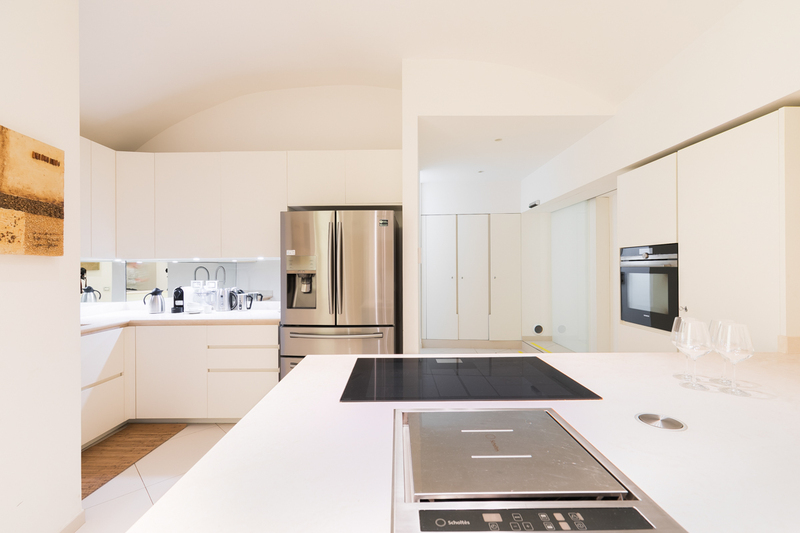 It is ideal for preparing delicious meals and features numerous stainless steel appliances. 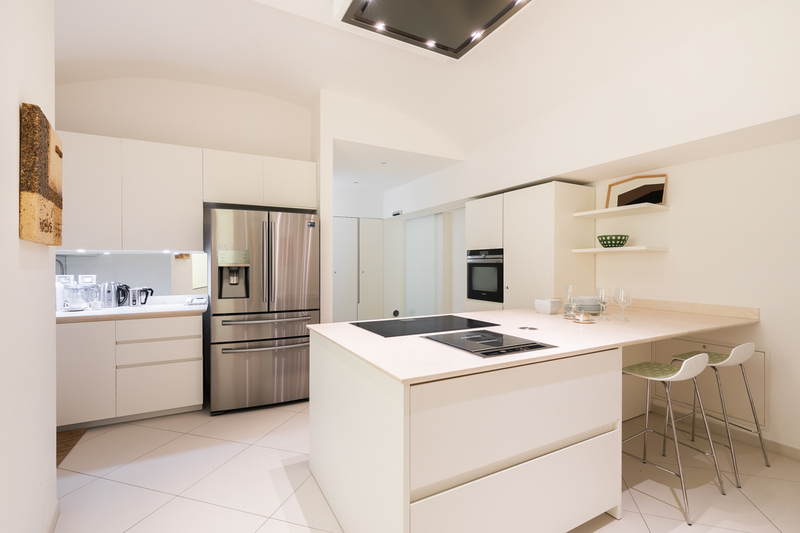 A large American fridge is at guests’ disposal with a water and ice dispenser, and all other useful equipment is included such as a coffee machine, kettle and utensils. 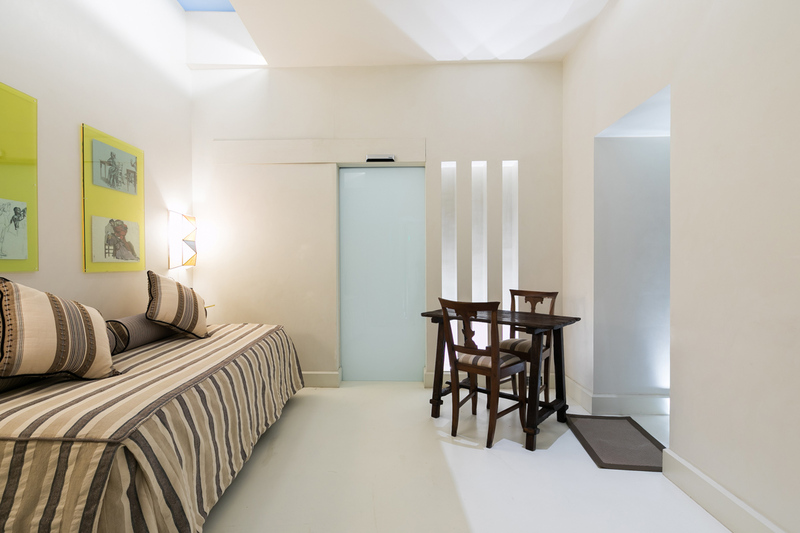 All rooms are equipped with the latest technology for maximum comfort of guests. 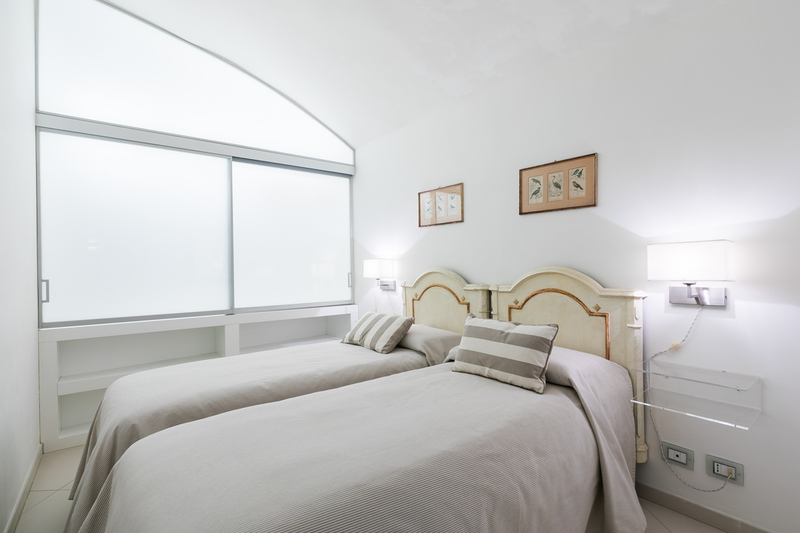 The bedroom windows are equipped with Privacy Smartglass, with individually controlled adjustable opacity, providing guests with total control. Smart TVs also feature in the master bedrooms and the living room, including Netflix. 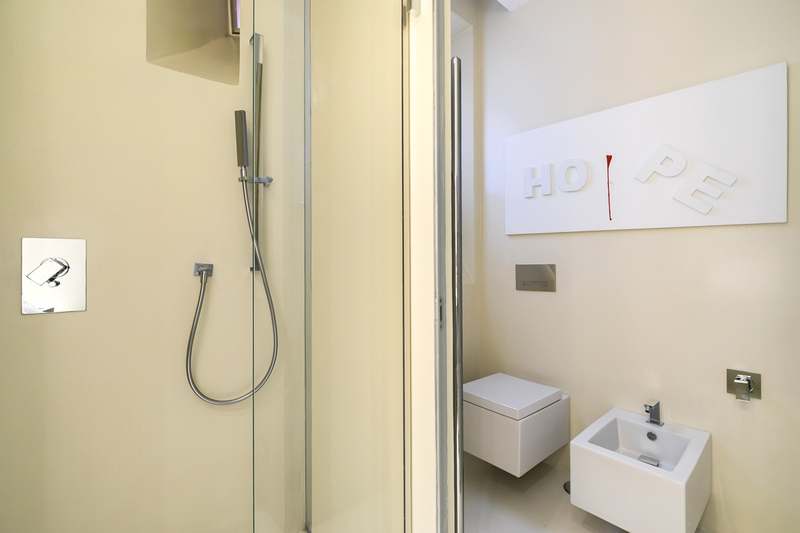 An advanced music speaker system has also been installed in every room, and WiFi is included throughout the residence. 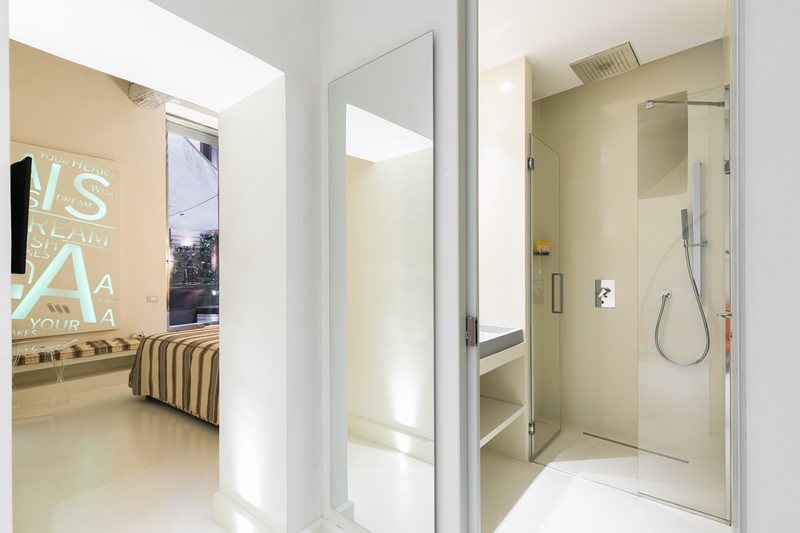 Guests are also free to use the laundry area of the house where they can wash and iron clothes during their stay. 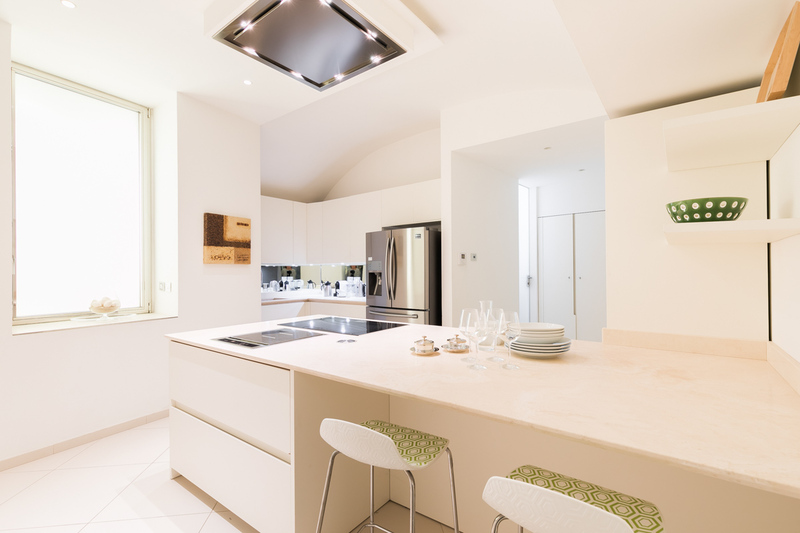 To provide comfort regardless of the season, the villa is equipped with a special underfloor heating and air conditioning system. 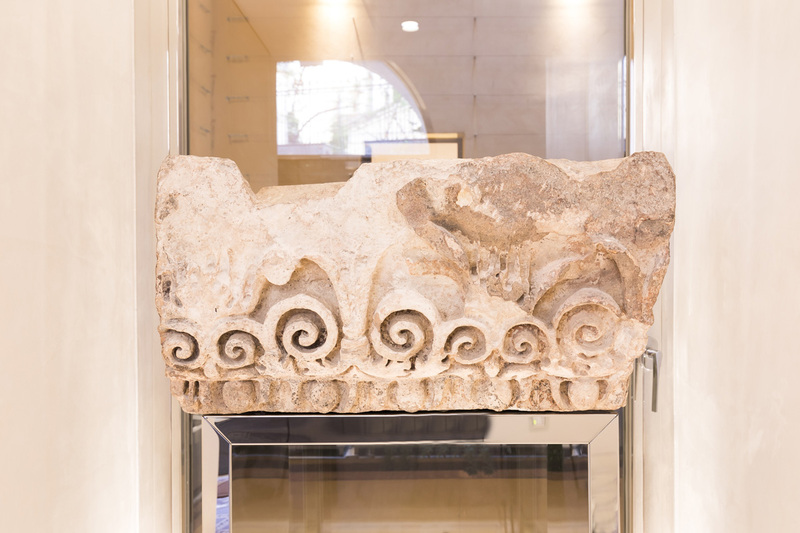 The entrance of the Rome Luxury Residence also features a video intercom system, and a burglar alarm has been set up inside the property to guarantee maximum security. Additional services for guests include a welcome drink upon arrival, a daily cleaning service, breakfast every morning, and a butler. Upon request, guests may also benefit from catering, babysitting, guide, personal training, massaging or personal training services. 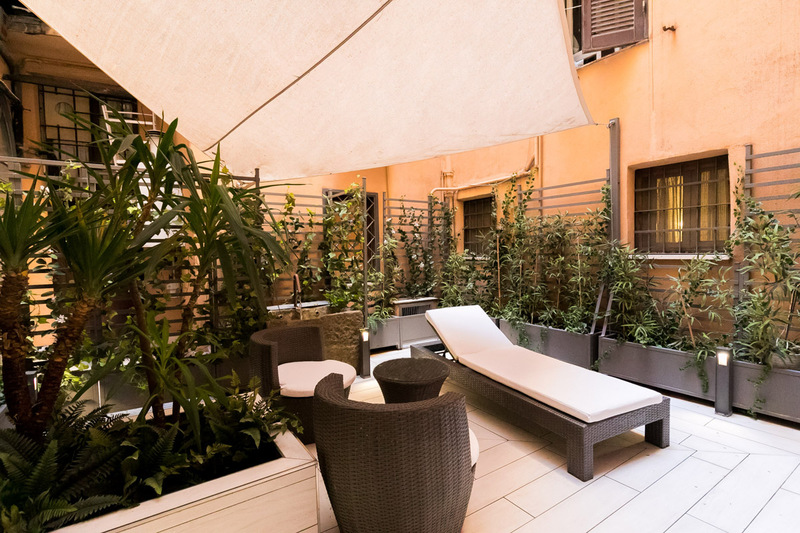 Located just off one of the most characteristic streets of the old city, the residence stands right at the heart of Rome. 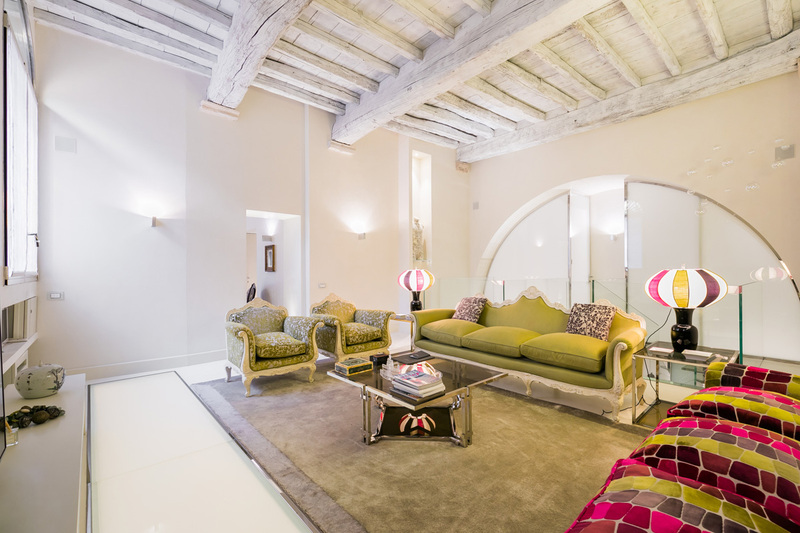 Its prime location makes it ideal for guests to visit the historical centre of Rome which is right at their doorstep. The spectacular Piazza Navona, the Sant’Angelo Castle and the Pantheon are all under 10min away by foot. The many other treasures of the Eternal City are also easily walkable, such as the Trevi Fountain, the famous Campo de’ Fiori or the splendid Piazza Venezia. Shopping enthusiasts should take a stroll down the Via dei Condotti near the Spanish Steps for a luxury browsing session. The heavenly Villa Borghese with its splendid gardens are also definitely worth a visit.